When you where young I am sure you got the question of “What do you want to be when you grow up?” Can you remember what you used to answer? I always wanted to be a teacher. I remember asking Santa for an overhead projector year after year so I could REALLY play school. Never got that overhead projector and still kind of want one. Fast forward to present day and looking at your current life and job- how have you lived up to your dreams and have you created a new dream for yourself? Take a few minutes as ask yourself a few of these questions. What would your dream life look like a year from now? What would it look like if you amplified that dream life by 50%? What would make that big dream come true? Can you imagine what it would be like to truly set some amazing, huge, outrageous goals? I know that can be overwhelming and scary and beyond what you want to truly dive into today, and if we don’t start being authentic and real we may never get to those goals. Some of y’all might have a big dream to start your own private practice and leave the secure clinical work, or others it might be to change carriers; whatever your big dream may be try writing it down on paper and see it and feel what that is like to own it today! 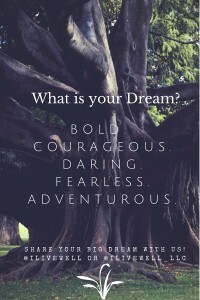 Courageous, daring, fearless, adventurous!! Gosh I love all those words, and they just light me o fire and inspire me to want to take on the world!!! It’s ok to dream big to the point is scares you a bit. Your big dream should be on the opposite side of your comfort zone! In all your communication with clients and loved ones you hear how clear communication makes a world of a difference. In your big courageous goal be clear! I want to be the the lead dietitian. (what does that mean?) Tell more behind that goal and give it some depth. Now that your heart rate is up a little it from writing out your adventurous big goal and owning, spend the next few days marinating on it and try sharing it with a few of your close friends. You may get s few dis-believers and even a few eye rolls, and the best is when you get the few, “That’s awesome!! I knew you had something big in you and can’t wait to see this come into your life!” If you are are opening and willing share your bold dreams below in our comment section to build up support!